The Royal College of GPs has accused the Scottish government of "long-standing underfunding" of GP practices. It has also criticised the "confusion" surrounding £500m of future spending commitments. The comments come in a written submission to Holyrood's Health and Sport Committee. The Scottish government said it had already committed to investing "a further £500m in primary care by the end of this parliament". The Royal College of GPs (RSCP) called on the Scottish government to say exactly how much it would spend on general practice in the next four years. It follows a statement by Health Secretary Shona Robison after the government announced that its share of health spending would be increased to 11% of the overall health budget by 2021. Ms Robison said: "This forms the first stage of the Scottish government's commitment to provide an extra £250m in direct support of general practice per year by 2021 - increasing the overall investment in primary care by £500m." 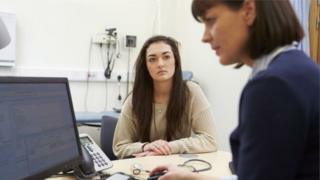 The RCGP said Scotland "does not yet have understanding of what 'in direct support' may mean and the point has been raised with Scottish government that the term is too broad and lacks sufficient clarity". It added: "General practice is in severe need of a clear, positive future, illustrated by adequate governmental investment, if it is to attract sufficient numbers of medical graduates to general practice specialty training. "If the long-standing underfunding and confusion that we are currently experiencing is to continue, we will keep witnessing a considerable number of general practices closing and transferring the running of their practices to Health Boards due to insufficient resource through which to remain solvent. "Patients will continue to be found queuing outside practices for the uncertain opportunity merely to register with a GP. It is a major deficit to bear such long-standing underfunding and confusion." Responding to the RCGP's submission, a Scottish government spokesman said: "As the First Minister announced last year, a further £500m will be invested in primary care by the end of this parliament. "This spending increase in primary care, to 11% of the frontline NHS budget, will support the development of a multi-disciplinary approach, with increased staffing as well as investment in GP services and health centres. "Health Secretary Shona Robison recently set out that £250m of this new investment will be in direct support of general practice, helping to transform the way services are delivered in the community - an approach that was agreed with the British Medical Association. "In this financial year, over £71m of that funding is to support general practice by improving recruitment and retention, reducing workload, developing new ways of delivering services and covering pay and expenses." Scottish Labour said the RCGP's comments were "absolutely damning". The party's health spokesman Anas Sarwar said: "Nicola Sturgeon has promised to boost the proportion of spending on GPs and it now appears she is going to renege on that promise. "The importance of GP surgeries cannot be stressed enough. Particularly as we face an ageing population, with people living longer, primary care will only become more and more important. "The reality is that under the SNP our health service is not prepared for this. "We would do things differently. Labour's government-in-waiting in Westminster would hugely increase the money available to our NHS as part of our plan to create a society that works for the many, not the few." Scottish Conservative health spokesman Miles Briggs branded the government's spending plans "a funding con". He said: "Nicola Sturgeon happily stood with GPs and backed their campaign for an extra £500m to be directly invested in general practice. "Now this has been cut in half, and the SNP is offering some waffle about the money being spent more generally. "It's no wonder doctors are furious about this deception. "The nationalists were happy to lap up the support of GPs when this commitment was made, but now seem to have completely u-turned on that promise."